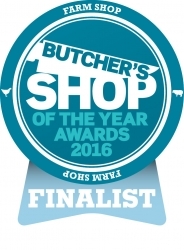 We are delighted to announce that we have just been informed that we are finalists for the Farm Shop of the year award, part of the Butcher’s Shop of the Year Awards 2016. The competition, run by the Meat Trades Journal, is nationwide and Little Town Farm Shop has made it through to the final four in the country! Judges visited the shop earlier this week to assess all aspects of the business, included presentation, customer service, facilities, history of the business etc. Rod Addy – Editor of the Meat Trades Journal said, ‘The level of entrants was extremely high which made judging extra challenging this year’. The Farm Shop at Little Town has been open approximately 12 years and now incorporates a range of home reared meats, local cheeses, home baked pies & cakes and prepared meals. Animal feed and bedding were introduced at a later stage followed by logs, coal & Calor gas etc. The shop also now boasts a fully licensed tea room and outdoor dining open 7 days a week. The team have been invited down to attend the finals which will be held in London in November. This will be a great opportunity to network with other businesses in the trade and we are thoroughly looking forward to the experience.